This distinctive model of ladderback dining-chair has long been thought to be Irish, on the basis of a set of twelve that were the dining-chairs at Coolatin, Co. Wicklow, an estate owned by the Earls Fitwilliam from the 17th Century. That set was sold from there privately but illustrated in Christie's house sale catalogue, 26 September 1977, lot 99, and offered again in these Rooms, 5 July 1990, lot 58. The research for the Wentworth sale (in these Rooms, 8 July 1998) revealed that the Coolatin set had earlier been at the Earl Fitwilliam's main English house, Wentworth Woodhouse, and were photographed there in the Old Hall by Country Life in 1924. 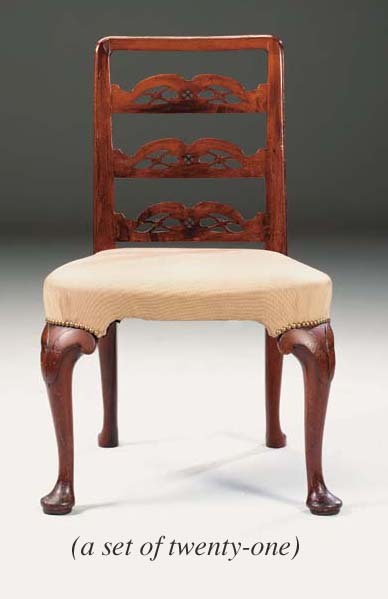 Furthermore a corner chair with the same legs but simpler back was included in the Wentworth sale itself (op. cit., lot 23). Given their unusual north country form it is likely that these chairs were supplied by the Wakefield cabinet-making firm of Wright and Elwick who made so much furniture for Wentworth Woodhouse in the 1750s and 1760s. The arched ladderback pattern is more usually associated with provincial chairs from Lancashire and Cheshire.